Summary: This is one disaster movie you really need to get on board with. An exciting, old-fashioned disaster movie with limited CGI and nary a villain worthy of the name, Tony Scott’s Unstoppable is rammed full of clichés. Yet it’s a thrill ride that grips right until the penultimate frames. Scott’s action movie CV is distinguished by overblown hits and misses, but this tale of a runaway freight train hurtling through rural Pennsylvania goes some way toward making up for his dreadful Taking of Pelham 123 remake. Reuniting Scott with Pelham 123’s star, Denzel Washington, and pairing him with Chris Pine, Unstoppable is based on actual events from 2001, much of the human error that sets the narrative in motion reflecting reality. 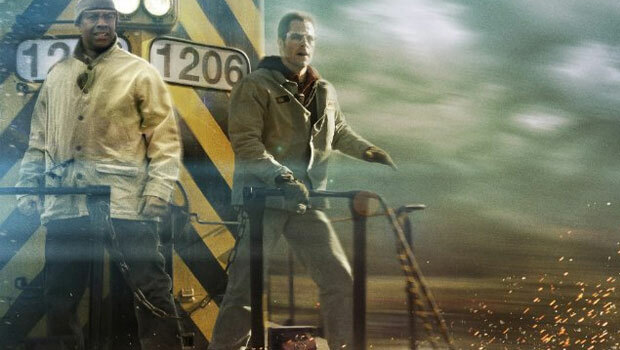 Although plenty of the plots details are jacked up, Mark Bomback nevertheless deserves credit for creating a believable script, a boneheaded miscalculation by a rail employee (Ethan Suplee) sending the unmanned train loaded with toxic material on its wild, increasingly destructive ride. Nobody is better equipped to stop it than Frank Barnes (Washington), a long-serving engineer who began his day partnered with a rookie conductor, Will Colson (Pine), a man broodingly preoccupied with his personal life. Their initial, getting-to-know-you friction is given plenty of time to develop as they learn their train is on a collision course with the errant locomotive. Washington is on good form pushing the distracted Pine’s buttons, but the pair bond as they hatch a plan to stop the speeding behemoth with the help of a sympathetic yardmaster (Rosario Dawson) over the radio, a proposal that stands a good chance of killing them both. The initial fractiousness between the protagonists, the intervention of rail boss (Kevin Dunn) and Frank and Will’s family squabbles all feel like they’re obstructing a better movie, as does an outrageously imperilled train full of boisterous schoolchildren. Fortunately, these diversions generally flash past and recede into the distance as Scott takes his time, ratcheting up the adrenaline, he and cinematographer Ben Seresin successfully building the layers of tension and suspense. The film’s second half in particular is wonderfully sustained, supplementing editing and camerawork typical of the genre with some unexpected angles and varied cutting, the runaway train itself increasingly resembling an unrestrained beast, ploughing on regardless through some gorgeous shots of the American landscape. With an affectionate nod towards roll your sleeves up, blue-collar heroism, Unstoppable will doubtless be derailed by queues for the new Harry Potter. But this is one disaster movie you really need to get on board with.